Lusis Payments is an innovative global software and services provider to the payments industry. Our proven, cutting-edge technology operates in numerous hardware and operating environments. The TANGO platform, combined with the know-how to mitigate risk and deliver high levels of assured customer service, constitutes a unique proposition for organizations faced with the challenge of adapting to traditional and future needs in the payments ecosystem. ​Central to the Lusis solution is TANGO, an online transaction processing engine for mission-critical 24x7 solutions including payments, retail, loyalty, finance, utilities, and transport. TANGO delivers performance, availability, and scalability, with a rich set of functionalities, all from a single application, a single code set and a single architecture. This flexibility and organizational dexterity makes TANGO ideal for the next generation of retail payment systems. TANGO is built on a highly performing micro-service architecture providing agility for your business needs. Lusis offers a highly effective and performant message translation and switching solution. Our products have been implemented for clients with extreme volume message switch processing needs. Lusis offers an advanced technological solution to compliment online transaction processing that complies with industry standards. From simple to complex deployments, Lusis provides highly flexible loyalty solutions that enable clients to gain significant market advantages over their competitors. Our LitePoS Terminal in the cloud is changing the payments processing world. LitePoS dramatically lowers costs and enhances revenue opportunities while allowing customers to break new ground with new and existing clients. Lusis provides an ultra-high performant trading platform for Forex, CFD, equities, and options. It integrates cutting edge technologies such as cryptocurrencies and Blockchain based settlement. Our clients are central to our thinking and to our actions. We aim to develop and maintain long term, mutually beneficial relationships, enabling our clients to develop a new payments landscape and allowing us to become a trusted partner. 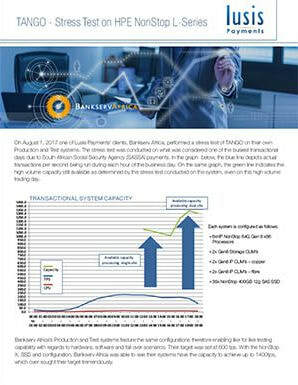 Lusis Payments participated in a proof of concept in 2014, which demonstrated that its TANGO platform is capable of processing 2,500 transactions per second (TPS) for 48 hours straight without failure. Watch the video to hear Randy Meyer, (HP Vice President & General Manager of Mission Critical Systems) and Bob Kossler (HP Director, Technology, Strategy and Planning) discuss details of this extraordinary benchmark and HP's partnership with Lusis Payments. ​"Our relationship with Lusis has been a tremendous asset to us...Philippe Preval the President (of Lusis Payments) has been a tremendous part of that success...he understands the payments marketplace and has has a clear grasp of the business and shares our passion for customers." ​The TANGO Payments Engine supports acquiring, routing, switching, authenticating, and authorizing transactions across multiple channels including ATM, Point of Sale, Internet, and Mobile Banking, in a multi-institution environment that may span different geographies.